I was at Marina Mall today and I was passing near the Adidas store when I noticed something. There was a new display inside with a built in screen. I straight away new that the stand was for the new Adidas 1 sneakers so I went into the store and I was right. What is the Adidas 1? The Adidas 1 is the first intelligent sneaker. It comes with a built in 20MHz microprocessor that adjusts the sneakers cushioning in response to different surfaces and if you went from walking to running. 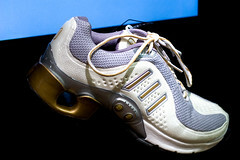 You can also adjust the cushioning yourself manually using the + and - buttons located on the side of the sneakers. Sadly, this smart shoes has 2 problems. The first, they are really ugly, gold and silver do not go well together. The second problem is the price, at KD93 these would be a pair of very expensive sneakers. Its like iPod or sneakers, tough choice.. So finally a shoe can possibly think smarter than a human being. so they only come in one color? This shoe looked so cool in the ads and now it looks sooo ungly. I don't understand how it works but it looks cool. I would try it but I wouldn't buy it.